Just select all of the text there (including the initial / character), and copy it using CMD+C. cd "Paste the directory's name here"
Sometimes you will also need to know the file’s name as well. 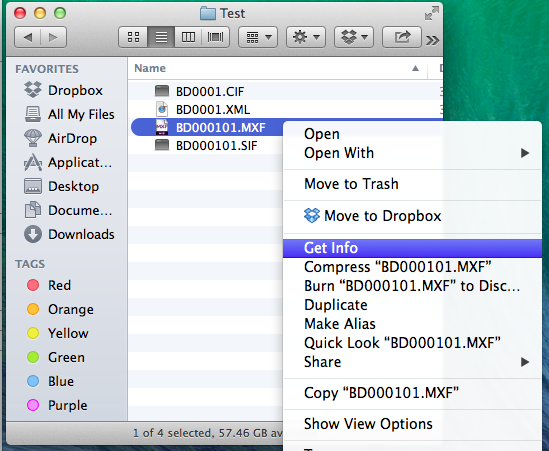 You can find the file’s name in the “Name & Extension” section of the “Get Info” dialog box inside Finder. Please make sure that “Hide extension” is unselected (check image above). If you know the initials of the filename or directory you want to type, you only need to type the first few characters of it, then press TAB. The terminal will automatically fill in the rest of the characters if it’s possible. To make it harder to make typos it’s preferred to copy and paste the filenames and directory names over from finder to the terminal. Never forget to surround them in quotes though! Note, that for these commands to work you have to install ffmpeg first on your machine. To install it you need to have administrator access to the computer. You can find the installation instructions in a later section. If ffmpeg is installed correctly it should return a wall of text similar to the image above. (so it’s ffmpeg then a space, then minus, then i, then another space, quotation marks ("), the file name pasted over from Finder, then another quotation mark, and finally ENTER. The important information about the file (bitrate, framerate, codec, video size, video and audio stream information) can usually be found at the bottom of the screen (marked in red on the image). ffmpeg -i "input filename" -map 0:0 -map 0:1 -map 0:2 -acodec copy -vcodec copy "output filename"
ffmpeg -i "input filename" -acodec copy -vcodec copy "output filename"
-vcodec copy will tell ffmpeg not to convert the video stream but keep it as-is. This will maintain the video stream’s quality, and will also quicken the conversion, as no transcoding will take place. "output filename": ffmpeg will know the target container type from the name of the output filename. So for example if you want to convert "BD000401.MXF" to a mov container, your output filename has to be "BD000401.mov"
ffmpeg -i "input filename" -map 0:0 -map 0:1 -map 0:2 -acodec copy -vcodec copy -ss HH:MM:SS -t HH:MM:SS "output filename"
The above commands are entirely optional. 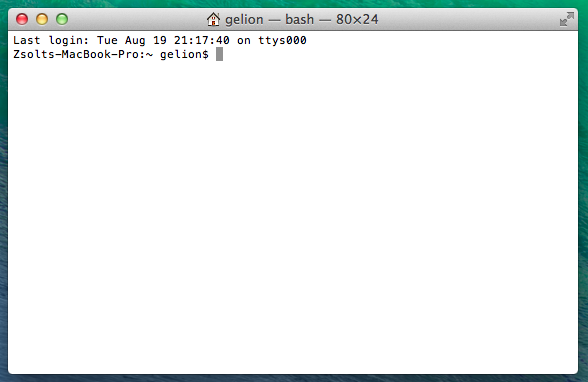 If only -ss is set, then video processing will begin at that moment, and will run until the end of the file. If only -t is set, then video processing will start at the beginning, but will stop after the specified amount of time. Note that -t and -to cannot be used at the same time. 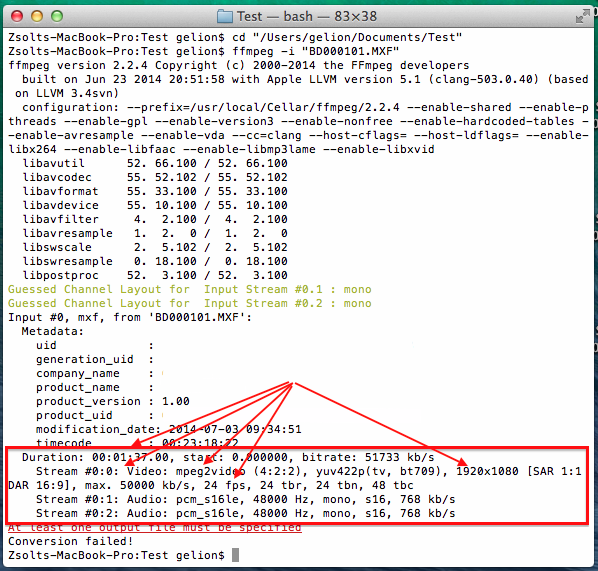 ffmpeg -i "input filename" -map 0:0 -map 0:1 -map 0:2 -acodec copy -vcodec libx264 -b:v 10000k "output filename"
Note, that for mov and mp4 containers using AAC is preferred, but unfortunately not all ffmpeg version support it. 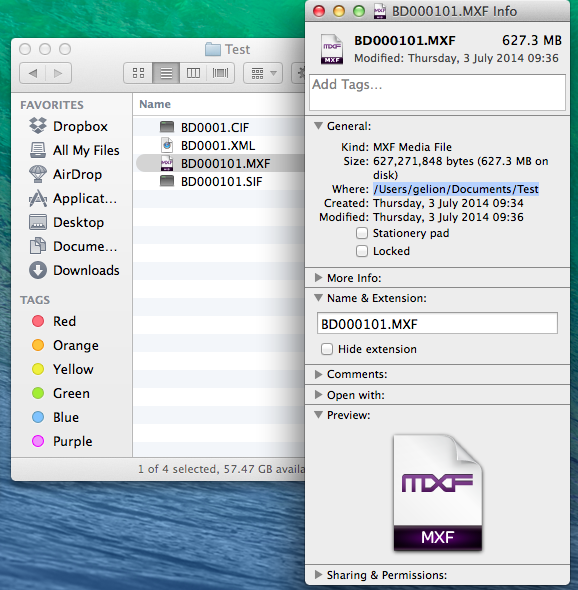 There are various ways to install ffmpeg onto OSX. 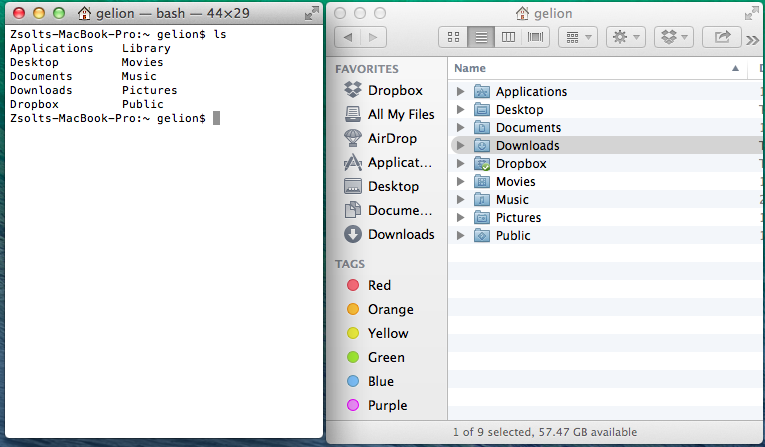 The preferred way is via Homebrew, but that involves installing XCode and additional programming tools to work. Note, that for steps 5 and 6 you will need administrator rights. This method is only plausible if you don’t have administrator rights and cannot get ffmpeg installed any other way. Steps 2 and 3 will make sure that anything you enter will be preserved, so it will be supported by the command line. Now inside the editor you can type any commands you want. 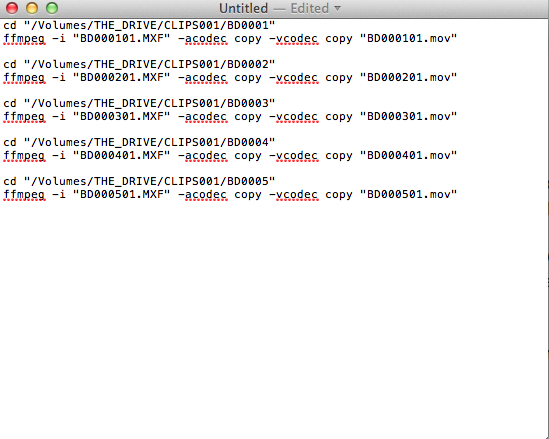 Usually you want to call cd and ffmpeg after each other multiple times, but with the directory and file names changed. So after the initial cd command enter a dot (. 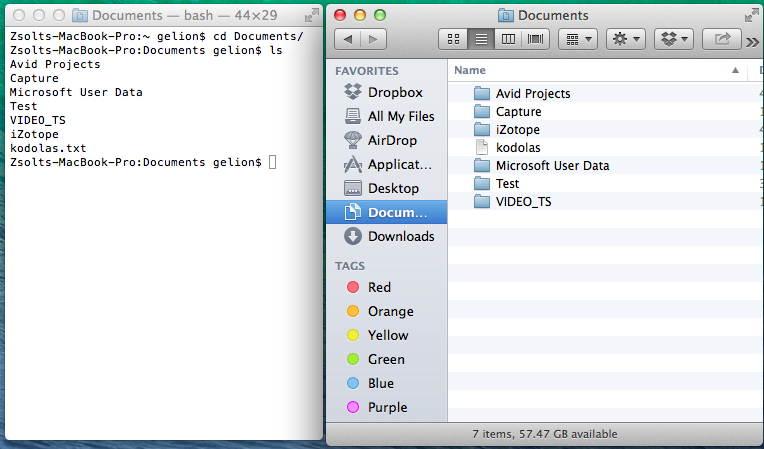 ), a space, and the name of the file (including the extension). Note that this will run the commands after each other, even if one of the encounters an error, so it is advised to only run the script with one ffmpeg command initially, and if it goes well add the remaining commands later, and re-run the script.